The exterior of your building is the first impression you present to clients, customers, workers and owners. Pavers, stone and concrete are the most common exterior finishes and accents used around the world. They are also some of the hardest materials to keep beautiful year round. Mold, mildew, rust, oil, and pollution are all aggravations that are faced every day. Our SurfaceBond Systems AC line of services are an ideal solution for the exterior areas of your building or facility. SurfaceBond is resistant to gasoline, oil, mold, mildew, efflorescence, dirt, pollution, acids, and other contaminants, both natural and unnatural. We also offer anti-graffiti, non-slip and color options depending on your specific application. Our professionally trained staff will deep clean your exterior surface, removing stains wherever possible. Once the surface is dried thoroughly, we will then apply the chosen system to your surfaces, leaving them with a newly refreshed look and an unbeatable layer of protection that can last years depending on traffic conditions. In the end, your exterior areas can be easily cleaned with water and much lighter cleaning solutions. This will save you time and money. Let people see your building's true beauty, and give them a first impression that truly reflects your quality. 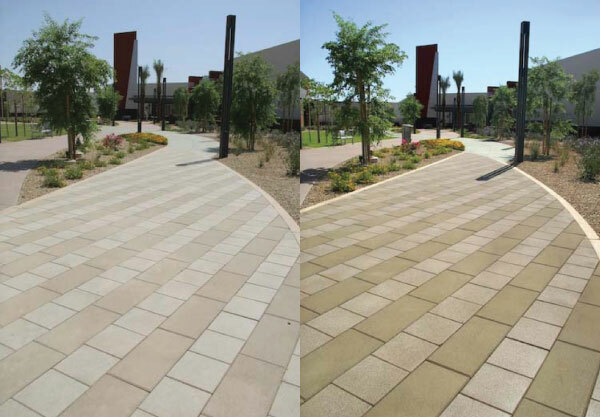 Below are examples of exterior pavers and concrete, both protected with SurfaceBond Systems AC line of services. You can see that SurfaceBond accentuates the natural or applied colors of the surface while giving protection from oil, water, grease, gasoline, pollution, acids and other contaminants that ruin the look of your surfaces.